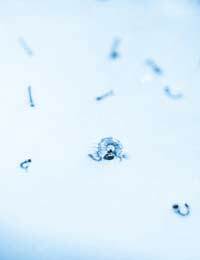 Home > Ask Our Experts > How Can I Get Rid of White Flies in my FishTank? Please can you suggest how to get rid of tiny white flies that are hatching daily. They don't die even when I try to drown them. The may be incubating in the corner as I have a corner unit Juwel filter system. They also dont mind the light fitted in the lid. When I lift the lid back and front they fly out and land on nearest wall where they stay until I vacuum them up about twice a day. I started having this problem since about april/may time. I clean and wipe down every corner and crevice when I clean approx 3-4weekly intervals. I have an assortment of fish such as gouramies, mollies tetra, 2 large clown loach and 2 large Denibarbs. which I've had for 5 years.The top feeders are not interested in eating the flies, maybe they can't see them because they are so light they just rest on the surface water so they are able to fly when the lid is lifted. The tank is 3 years old and well maintained. Have you any suggestions other than transferring all the fish into a temporary tank tank and cleaning from scratch? It took ages for the clown loach to trust me when they were moved into this tank 3 years ago. First of all, let's take a look at the probable cause of the problem, and then we'll see how you can treat it. Even when you're very thorough, I'm afraid that cleaning every three to four weeks simply isn't enough. It would be better to clean once a week, even if you only have time to do so lightly, then continue with your thorough cleaning routine as usual. This will help to prevent a build-up of waste in the tank which is almost certainly the cause of the outbreak - the fly larvae need something to feed on, or they wouldn't be there. You may not be seeing this waste in the water because it's all getting sucked into the filter, creating the perfect environment for the flies. First of all, you need to change your filter medium. Don't try to clean it, just throw it out (preferably outside your house, in case more flies are ready to hatch) and put in a new one. Then remove all the non-electronic parts of your filter - tubing, plastic casing, and whatever else you can get to, excepting the medium - and boil it. If you dip it in cold water afterwards it should be ready to return to the aquarium immediately, so the whole process need only take ten minutes, and your fish can manage without their filter for that long. This should kill off most of the flies and fly larvae. If you continue to have problems, consider getting some more aggressively insectivorous fish for your tank. Guppies would be a good choice - they should get on well with your other fish, they're hardy, they won't take up much space, and they'll eat pretty much anything they can find on the water surface. They're also very good at spotting prey. Many aquarists have problems with insects from time to time. It can be very distressing to find your home infested, but I really think that if you make an extra effort to clean your tank then this problem will diminish. Make sure you're not overfeeding your fish and rinse your filter medium regularly. Good luck! Had these flies before and found alternative and supplimentary advice that said to blackout your aquarium with sheets for a minimum of 48 hours but ideally 72 hours, internal lighting off for the duration. It worked for me both times i had them! I need some information of tropical tank infestation I have a problem with a small flea type insect accumalating in my tank lid as fast as I destroy them they seem to reappear I think it may be food related but cannot be sure, have you any suggestions on this matter, I would appreciate any help on this matter.